Fungus shapes a strange kind of ice called hair ice that is found only on rotting logs. These can be seen mostly in broadleaf forests between the latitudes of between 45° and 55° N on a cold morning. There, amid patches of snow and frost, a keen eye might spot delicate crystals extending from wood in filaments about 0.01 millimeters thick. The Pororoca is a tidal bore, which causes never-ending waves as high as 4 meters, which travels up the Amazon River and its tributaries. It attracts surf competitors from all over the world. The longest record for surfing a single wave is 37 minutes and was for a distance of 12.5 km. The tides can travel as much as 800 km inland upstream on the Amazon River and adjacent rivers. Lake Natron in Tanzania is a very shallow salt lake that has a ph level of 10. Its color varies from orange to red, to pink, because of the bacteria and algae, which make it inhospitable to life, except for flamingos, that nest here and feed on red algae despite the alkaline water. It is a safe breeding place for these birds since no predators come to this unfriendly terrain. The lake’s shoreline is full of stiff calcified corpses of a variety of birds and bats that met their untimely demise after crashing into the deadly waters. The soda and salt cause the creatures to calcify, perfectly preserved, as they dry. Penitentes are a snow formation found only at high altitudes. They take the form of tall thin blades of hardened snow or ice closely spaced and pointing in the general direction of the sun. Penitentes can be as tall as a person. Raining animals is a rare meteorological phenomenon in which animals fall from the sky. 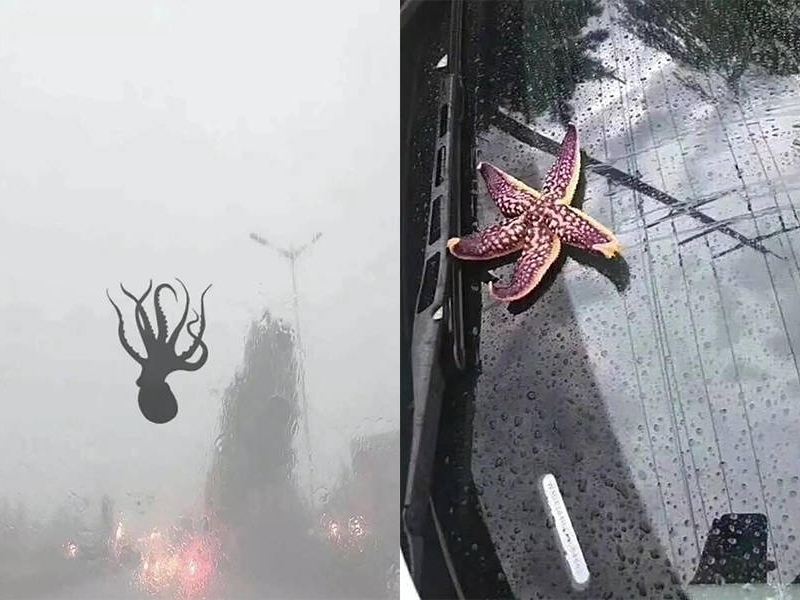 There are a few theories about how this happens, one suggests that strong winds traveling over water sometimes pick up creatures such as fish or frogs, and carry them for up to several miles. However, while people have witnessed the animals actually falling, this initial stage of where and how the animals get grabbed up in the first place has never been witnessed or scientifically tested. In some reported cases, the animals fall to the ground intact and alive, and in some, they are found frozen or shredded. Located in Siberia, Laka Baikal is one of the largest freshwater lakes by volume in the world, comprising of 20 percent of the Earth’s freshwater. The lake is 25 million years old and is home to over two thousand varieties of flora and fauna. During winter when the lake freezes, large shards of ice form on the surface of the lake giving it a gorgeous look of turquoise ice. Pele’s hair looks like a bird’s nest but it is, in fact, a form of lava. It is named after Pele, the Hawaiian goddess of volcanoes. It can be defined as volcanic glass fibers or thin strands of volcanic glass. The strands are formed through the stretching of molten basaltic glass from lava, usually from lava fountains, lava cascades, and vigorous lava flows. Wind often carries the light fibers high into the air and to places several kilometers away from the vent. It is common to find strands Pele’s hair in high places like the top of trees, radio antennas, and electric poles. Blood Falls is in one of the driest regions of Antarctica. Iron-rich hypersaline water sporadically emerges from small fissures in the ice cascades. The saltwater source is a subglacial pool of unknown size overlain by about 400 meters (1,300 ft) of ice several kilometers from its tiny outlet at Blood Falls. Chemical and microbial analyses both indicate that a rare subglacial ecosystem of autotrophic bacteria developed that metabolizes sulfate and ferric ions. Desert Roses are mineral crystals. They are rose-like formations of crystal clusters of gypsum or barite that form in arid sandy conditions. The crystals form a circular array of flat plates, giving the rock a shape similar to a rose blossom. As the earth is warming up, it is giving rise to a new scary phenomenon. It turns out that when the frozen methane trapped in the Siberian permafrost gets warm enough; it turns into a gas and eventually builds up so much pressure that the ground explodes. The loud boom and giant hole these explosions create were first reported in 2013. An explosion in 2017 left a new 165ft deep crater in northern Russia. There are warnings of more than 700 sites in the region where further methane gas eruptions are predicted.